This 15 foot (8′ wide) 4 Station Portable Shower Trailer with Sinks | Classic Series includes 4 private unisex suites, each with entrance door, fold up steps for each door, handrails, outdoor lighting, and occupancy indicators. This shower trailer has an easy-to-use roomy interior, with on-demand LP gas water heater for comfortable and efficient hot showers. This 4 Station Portable Shower Trailer with Sinks | Classic Series is equipped with fiberglass showers, one-piece rolled grey rubber flooring and rubber-based trim, and 12 volt LED ceiling lights. Each suite includes: fiberglass shower with rod and curtain, bench, and abundant interior lighting. This trailer is equipped with 150 gallon water tank and 530 gallon waste tank. This unit is constructed with a white gel-coat fiberglass for a long-term maintenance-free exterior. Your guests are sure to enjoy the comfort of a fully climate-controlled environment maintained by air conditioning and heat strips, as well as a 3 Season package for cooler temperatures. Smarter Restrooms App - An interactive tool allowing portable restroom rentals fleet owners to monitor operational systems for their trailer(s) from any smartphone, tablet, or computer. You can easily maintain systems operations with the ability to monitor waste and freshwater tank levels, power, and interior climate control. Financing available with deposit and approved credit. 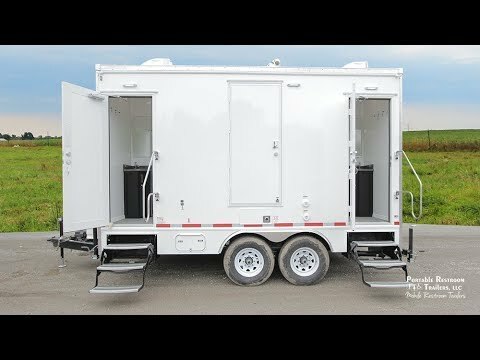 © 2019 Portable Restroom Trailers, LLC. | All Rights Reserved.